Common geraniums are one of the most popular flowering annuals grown in gardens across the United States. Use the versatile plants as bedding plants, in window boxes and hanging baskets or as houseplants. The attractive flowers grow from 6 inches to several feet tall, depending on the cultivar selected, and appear in a variety of colors except yellow and blue. Care for the outdoor or potted geranium plant so it remains healthy and livens the landscape with bursts of fresh color. Plant the geranium in a sunny spot with well-draining, organic soil in spring, when the danger of frost has passed. If planting it in a container, select a large one with drainage holes through the base. Ideally, four to six hours of daily sunlight help the plant flower and flourish, but the plant benefits from a few hours of shade during midday in very hot areas. Water the soil deeply after planting and regularly afterward. Allow the soil to dry between watering. Provide the soil around the plant a slow and steady stream of water to prevent wetting the foliage, which favors the development of fungal disease. Spread a 1- to 2-inch-thick layer of mulch around the base of the geranium to prevent competing weeds from growing nearby. Mulching also keeps the roots cool, increases aeration and prevents the soil from crusting. 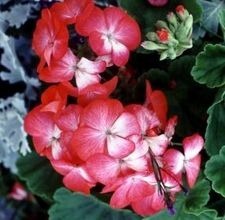 Feed newly planted geraniums 1 lb. of 10-20-10 fertilizer for every 100 square feet. Spread fertilizer granules evenly around the plant and irrigate as normal to assist soil penetration or use a water-soluble fertilizer. Feed growing geraniums a water-soluble fertilizer every four to five weeks during the growing season. Mix 2 tsp. of a well-balanced 20-20-20 fertilizer to 1 gallon of water or feed the plants 2 lbs. of 8-8-8- or 10-10-10 fertilizer per 100 square feet. Pinch back spent flowers from the plant to encourage healthy blooms and prolong growing season. Remove damaged leaves or stems to maintain the appearance of the plant. Collect clippings from the ground and discard to prevent disease. Inspect the plant for insects such as caterpillars, slugs, mites, aphids and whiteflies. Use commercial traps or hand pick slugs and caterpillars with tweezers. Spray the plant with horticultural oil to deter mites, aphids and whiteflies. Inspect the plant for diseases such as rust, bacterial leafspot and black stem rot. Trim infected parts of the plant to prevent spread to other parts and apply a registered copper fungicide to treat the infected area. « When Can Geraniums Be Outside?